I am very bad at following diets. Though I followed Priyanka’s diet (and it worked.. 🙂 ), I get bored very easily. I have very little self resolve when it comes to food. Though I don’t eat a lot, I always eat what I want. This sometimes creates a problem, as I have a great tendency to put on weight. So today I am just gonna share with you some breakfast recipes, that are filling, tasty and yet will help you in weight loss and maintenance. 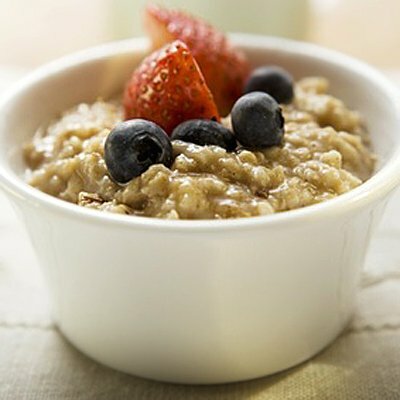 Take oats and skim milk in a pot. Add the condiments and honey/jaggery. Let it simmer till oats are done. Add chopped fruits and nuts. Enjoy hot, healthy and extremely filling breakfast!! Oats will provide you with lots of fibre which fills you up and helps in reducing bloating and also cholesterol to some extent. Honey and jaggery are good sweeteners as they have the goodness of vitamins in them. Refined white sugar is a complete no-no. You can use any fruits that are available in the season and at hand. Calories: Around 250 depending on the fruits used. Banana and pineapple are the fruits with maximum sugar content. All the vitamins, minerals and goodness of fruits without excess calories. Fruit smoothie retains fiber which is lost in Fruit juices. So a better and healthier option. Calories without toast– Around 250. Add chopped onion and garlic to the oil. Add the veggies if using. Add the ketchup and soy sauce with pepper and salt. Serve hot with a Whole grain toast. You get a really filling breakfast. Add another toast and you can make a brunch out of it. Tangy and tasty without using excess oil and salt. To prepare the chillas (or pancakes), heat 1 tbsp oil in a non-stick frying pan. Pour a ladle of batter and roll it around to spread it evenly. Cook on reduced heat. 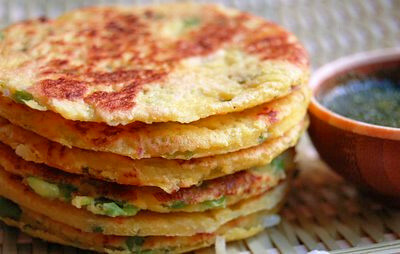 When almost done, spread a tablespoon of the paneer filling on the pancake. Turn it over and cook on the other side till done. Gram flour has fiber and most importantly proteins that are not present in atta or maida. Calories: Around 125 per thepla with half a cup yoghurt. Mix all the ingredients in a bowl including the methi leaves. Knead it. Let it stay for 15 minutes. Then make even size small balls of the dough. Roll them separately with a rolling pin into a round shape. Heat the tawa and roast each of the rolled out theplas one by one. When evenly roasted from both sides, remove it from tawa. Use a non-stick pan to avoid using oil. Use a little amount if needed. Serve them hot with low fat yoghurt. Easy to make, no oil required. There is something mentally satisfying about eating roti-like dishes. Methi leaves are rich in Iron and vitamins. Yogurt gives you rich dose of calcium. Yogurt is much easier to digest than milk and hence less fattening. All the above recipes can be made really interesting and tasty by adding a generous sprinkling of Chaat Masala. Chaat masala is the best friend of any dieter!!! It has helped me immensely whenever I went on any diet. Try the above recipes. All of them are meant to be healthier replacements to fattening breakfast options. Hey Radhika.. Would you mind if we call ypu new Radhika??? He he… I love Oats Vinitha… I also wanted to add the Oats Upma but forgot..
Don’t you just loooovvve the Paneer Chilla???? .-= Gaea´s last blog ..MAC Studio Finish SPF35 Concealer vs Shiseido Corrector Pencil =-. Hey loovvved the recipe Gaea.. Will try it soon..
Lotsa people add eggs to the smoothie itself.. but I have never even DARED to do that!!!! Gosh, tat will kill it 🙁 i could never do that one. .-= Radhika´s last blog ..Whats better than a Chanel =-. someone who likes – ok! i’d say u respect others’ opinions. I like everything except the oatmeal.Just can’t stand the taste.My mum makes the best oat cookies though which I’ll substitute for your recipe. .-= Sonia´s last blog ..My Take – Aroma Magic Peppermint Exfol Gel =-. :clap: :clap: :clap: :worship: :worship: :worship: :worship: Jomol..for today and today only I shall not fight with you…you awesome. jst read out my soln.guarentee u’ll loose w8..i hav tested. i dnt think these recepies gona put sme effort as they r prepared wid oil..best breakfast wd b sliced bread(4 pieces) wid chopped cucumber,onion,green chilly,tomato n carrot.. The recipes are good but calories not accurate . Especially paneer cheela . Good .. 🙂 I should definitely pronounce, impressed with your recipes. I had no trouble navigating through all the tabs as well as related information ended up being truly easy to do to access. I recently found what I hoped for before you know it in the least. Scrambled egg is not same as bhurji… The recipe above is that of bhurji… A classic scrambled egg is made with milk… It has no onion or Masala.